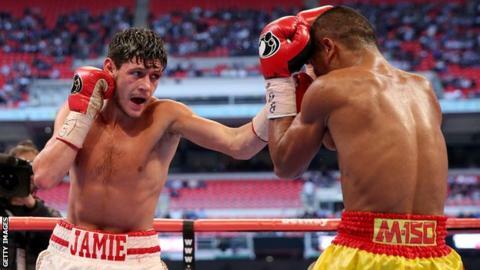 Fernando Vargas has replaced Juan Alberto Rosas as Jamie McDonnell's opponent in his WBA bantamweight title defence in London on Saturday. McDonnell, 30, had been set to face Rosas on the undercard of Anthony Joshua's IBF world heavyweight title bout with Charles Martin at the O2. But after suffering a sparring injury the 31-year-old has withdrawn, to be replaced by fellow Mexican Vargas, 27. It will be McDonnell's first UK bout since beating Javier Chacon in 2014. The Doncaster fighter, who has won 27 of his 30 contests, beat Japan's Tomoki Kameda in both of his past two bouts. Vargas has won 29 of his 42 career fights, most recently beating former WBO super bantamweight champion Wilfredo Vazquez Jr in Brooklyn in June. "It's a massive chance for Vargas. It means everything to him and he's going to bring the fight to me, but I am focused, feeling sharp and looking to make a statement," McDonnell said. "I've been training for lots of styles so it doesn't bother me. I'm just buzzing to be back in the UK and ready to put on a show." McDonnell won the WBA title with a 10th-round stoppage of Thailand's Tabtimdaeng Na Rachawat at Wembley Stadium in May 2014. He had previously been stripped of the IBF title for failing to fight the federation's mandatory challenger in the advised timeframe.